SAN DIEGO --- Kratos Defense & Security Solutions, Inc. today announced the company will officially unveil a new class of unmanned aerial systems that represent the future of air combat at the 2017 Paris Air Show. Kratos is at the forefront of unmanned aerial systems with its ability to rapidly design, develop, demonstrate and deliver affordable high-performance jet powered drones. 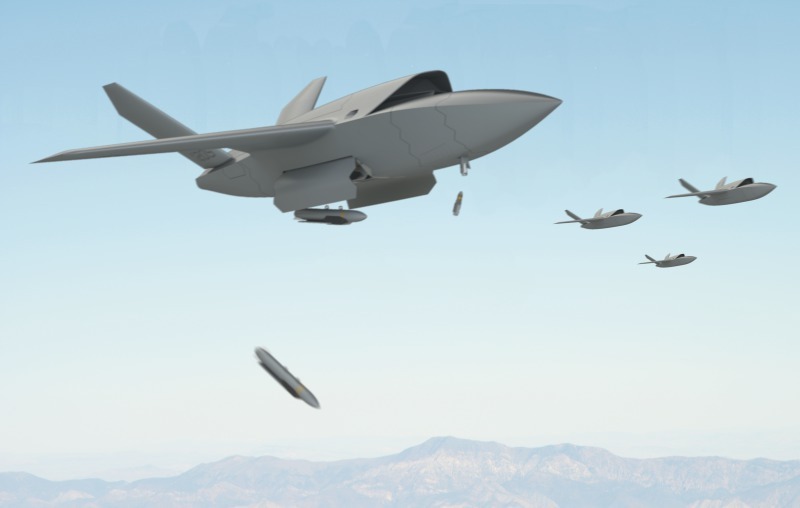 At the show, Kratos will be presenting the XQ-222 Valkyrie and UTAP-22 Mako drones that provide fighter-like performance and are designed to function as wingmen to manned aircraft in contested airspace. The Valkyrie and the Mako represent the next generation of UAVs. They are highly maneuverable, stealthy, able to fly at near supersonic speeds, and can carry and deploy weapons or surveillance systems. The larger Valkyrie, measuring in at roughly 30 feet in length, has an impressive range of more than 3,000 nautical miles. Most important, Kratos’ UAVs are aligned with emerging military strategies because they are reusable and lower priced -- in the $2 million to $3 million range. This makes it cost efficient to deploy them in numbers that can effectively support manned aircraft or operate independently in combat. The Valkyrie was recently announced by the Air Force Research Labs (AFRL) at a presentation on its Low Cost Attritable Aircraft Technology (LCAAT) program at Wright Patterson Air Force Base. The Valkyrie has been in development since July 2016, when the U.S. Air Force awarded Kratos a contract to develop the LCAAT. After a less-than-two-year design and development effort, the Valkyrie is scheduled for its first flight in spring of 2018. The Mako is already operational and is scheduled for follow-on test flights, where it will carry sensors and be teamed with manned aircraft, in June, July and August of this year. The Paris Airshow is the largest aerospace event in the world and will be held June 19-25. Kratos will be hosting visitors at booth # 3 A118. Kratos Defense & Security Solutions, Inc. develops transformative technology for the Department of Defense and commercial customers. Kratos is changing the way breakthrough technology for these industries is brought to market through proactive research and a streamlined development process. Kratos specializes in unmanned systems, satellite communications, cyber security/warfare, microwave electronics, missile defense and combat systems.